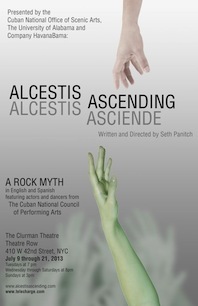 Join us for our second UANYC Night at the Theater for Alcestis Ascending: A Rock Myth at the Clurman Theatre (410 West 42nd Street between 9th and 10th Avenues). The show begins at 8 p.m. Written and directed by Seth Panitch, Associate Professor of Acting and Director of the MFA and Undergraduate Acting programs at Alabama, the play is a historic collaboration between the University and the Cuban National Office of Scenic Arts. The production runs at the Clurman Theatre from July 9-21. For the July 11 show, Dean Robert Olin and the College of Arts & Sciences is offering a special ticket price of $15 (regularly $42.50) for Alabama alumni. To order tickets, go to www.broadwayoffers.com or call 212-947-8844 and use code TRTIDE. Dean Olin is also hosting a reception following the performance.